En route, we stopped at Hardwick Hall in Derbyshire, famously known as “more glass than walls”. Hardwick was built by Bess of Hardwick in 1597, replacing an earlier house, the ruins of which still survive. Bess married four times, accumulating considerable wealth which helped to pay for the building work. Hardwick is one of the best-preserved Elizabethan houses in the country as, latterly, it has been used as a house for dowagers by the Devonshire family, their main residence being Chatsworth nearby. In Yorkshire, we stayed at The Old Parsonage, a very comfortable hotel in Escrick. On Saturday, in misty weather, we visited Fountains Abbey which was founded in 1132 by 13 monks from York and which became very wealthy. Wealth was gained from rich people paying for prayers for when they died, to ensure a smooth route to heaven! We were given a fascinating tour of the vast ruins by an excellent guide who described the daily routine of the Cistercian order. The abbey was self-sufficient with its own mill and various workshops plus houses for visitors. Also, there were the Sudeley Gardens which were in the style of Stourhead. Later, we travelled on to Beningbrough Hall. This was a very attractive, symmetrical, brick-built Georgian house, housing a collection of royal portraits form George 1 to the present day and pictures from the Royal Portrait Gallery in London. On Sunday, the day was devoted to visiting York. Most members went on two walking tours of the city, taking in the history and age of the buildings as well as enjoying the view of the minster from the walls. We learned that a small alley is known as a “snicket”. The history of the city dates from Roman times (around 200AD). Constantine was proclaimed Emperor whilst in York and the Emperor Severus was buried there. The city grew to become an important centre for trade and political influence but declined during the 1800s as industries developed in areas like Leeds. Sir Walter Scott helped to revive York as a tourist centre including saving the walls from demolition. After lunch, some members visited the Yorvik Viking centre and afterwards, several attended Choral Evensong at the minster, a peaceful end to a busy day. On our way home on the Monday, we stopped at Calke Abbey, a country house which evolved from what had been a priory. Owned latterly by an eccentric family, the house was full of hidden treasures including stuffed birds and animals, family portraits and a stunning state bed dating from 1734. There was also an attractive walled garden, orangery, church and nature reserve. As a postscript, Jane Cox who has been investigating medieval life in Box, found a link in Calke Abbey to the Bigod family! A highly enjoyable weekend away was had by all ! The weekend away nearly didn’t happen this year as Hatts, the coach company, fell into administration just before we were due to travel. Fortunately, Brian Hatton and Tom Cox rode to the rescue and found a replacement coach company, Barnes. Ably organized by Tom and Jane Cox, we travelled to the very attractive area around York. On 14th August the Box Nats visited Bletchley Park and welcomed on board the coach a few members of the Box Gigs who joined us. 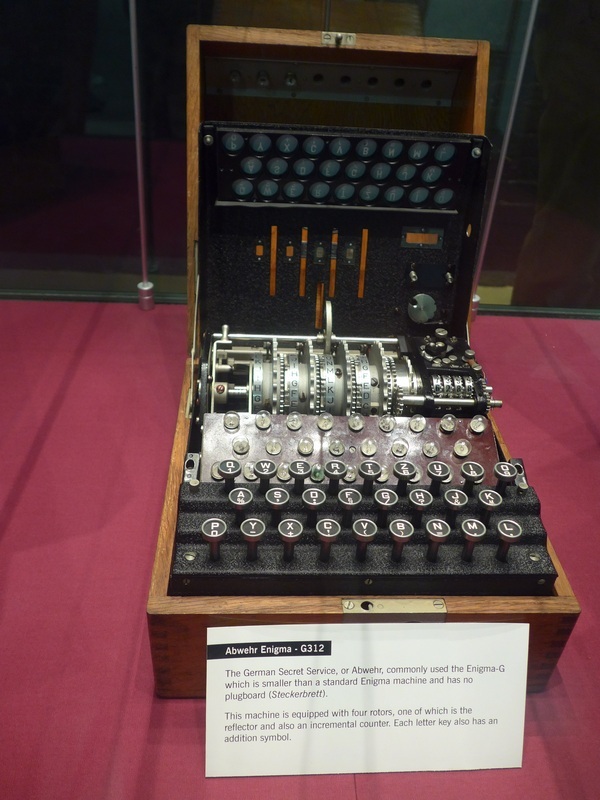 The Second World War –code breaking site in Hertfordshire has this year completed an £8 million restoration project and the small country estate was home to thousands from all walks of life who broke the Enigma codes. Until the 70’s very little was known about it and it was shrouded in secrecy but now visitors are welcome to explore Bletchley’s wartime past and experience a nostalgic sense of place and history. Our visit began with a private lunch for our group in the magnificent Mansion, a Victorian domed and turreted country house, bought by a builder in 1938 with plans for demolition but it was almost immediately then taken over by the Secret Intelligence Service together with the surrounding 58 acres and lake for use in intelligence and code-breaking operations in the event of war. Following lunch we collected our electronic guides with headphones and started to explore the numerous restored huts and viewed code-breaking machines and learnt about the vital role Bletchley took in WW11 and the pivotal work achieved there. The interpretation in the huts and museums was educational and thought-provoking with atmospheric soundscapes, interactive activities and exhibits and with re-created machines such as the ‘Bombe’. Some of us joined an hour long guided walk and we learnt many things we may have otherwise missed including how the workers were housed and fed, their work so top-secret that most of them never spoke about it for the rest of their lives. It was agreed that although the journey there and back was long, and that we did not have enough time to view everything, it had been worthwhile to visit the place which heralded the birth of the information age. We experienced a unique and cultural day out. Bletchley Park – The Modern World was born here! 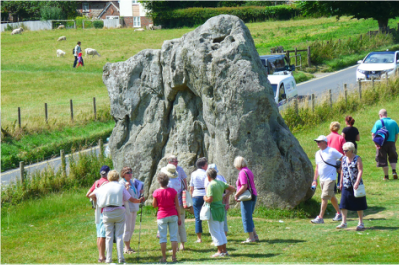 Our July outing saw members heading for Avebury where our first port of call was the recently renovated Avebury Manor. It was interesting to visit a NT property where one is encouraged to touch the every day items of yesteryear. The billiards table was available for a game and many of us enjoyed trying out the bouncing exercise chair. After an excellent lunch, some of us joined an extremely interesting guided tour of the stones whilst others wandered around on their own and visited the Alexander Keiller museum and the Parish Church of St James.